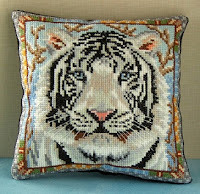 Sheena Rogers Designs: Poppies and Tigers! Two new kits were launched on my website recently. Snow Tiger is the second in the Big Cats group of my Wildlife Collection, and the Leopard design is already half way complete. The Lion will be the fourth cat and then I will start working on the Wild Dogs group. There will definitely be a Wolf and a Fox but I'm still deciding on the others. The eighth month is now represented with a mini cushion kit. August features bright red poppies tipped with deep orange and red gladioli. This mini cushion would also make a lovely rememberance momento for November time too. The September design features bright pink Asters and purple Morning Glory and is currently being stitched. In between the stitching I've been working on another new creative project. I'm working up some of my mini cushion designs into large wall hangings - and I'll post more about the project later in the year. 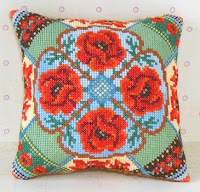 The copyright for the designs and images used in this blog belongs to Sheena Rogers. 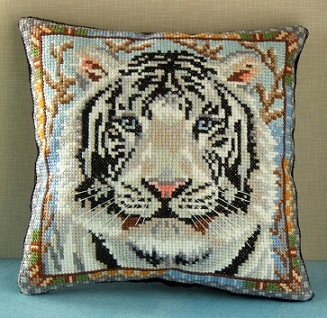 Screams, Vikings, Tigers and Death - A Cross Stitch Thriller! A Touch of History and a Finishing Touch! All things Gardening plus an Alien or two! Zombie eyeballs and Clarice Cliff! !